Off and on rain showers again today. 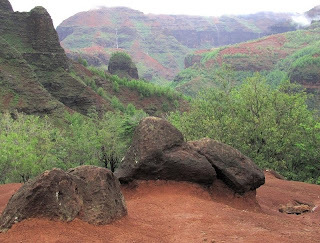 The highlands look a bit fogged in from Waimea, but we drive up to the Kukui Trailhead in Waimea Canyon State Park. It's foggy, but it isn't raining and we set off descending the switchbacking trail into what Mark Twain called the "Grand Canyon of the Pacific." We drop below the fog layer and the colorful walls of the canyon come into view; waterfalls stream off the cliffs.